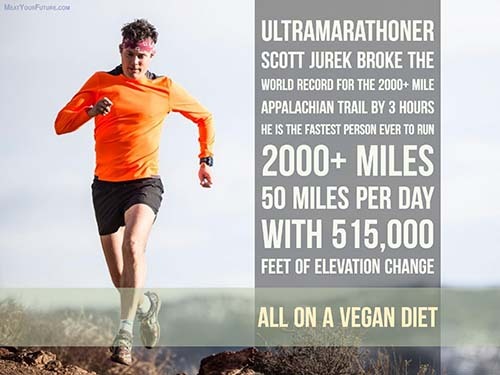 Scott Jurek is an American ultramarathoner who, in 2015 at the age of 41, broke the world record for the 2,168-mile long Appalachian Trail. He completed this epic run in 46 days, 11 hours and 20 minutes (~50 miles per day), breaking the previous record by 3 hours. He is vegan, having given up meat in 1997 and becoming 100% vegan in 1999. The fact that we do not biologically need to consume any animal foods is not controversial within mainstream medicine and nutrition. So, why continue supporting the animal exploitation and slaughter industries when it’s completely unnecessary (and in fact counter-productive) for our health, is driving a global environmental disaster of immense proportions, and is inflicting unimaginable suffering upon countless billions of sentient animals every year? Please consider these issues and go vegan, and, if you’re also so inclined, run a few marathons too!